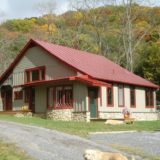 Charming farm stay nestled in the mountains, just minutes from Lexington, Virginia. 2 BR. $150-$250. Children Welcome, WiFi, Smoke-Free Property.